Lowepro Pro Trekker 300 AW is a expedition camera bag to carry a Pro digital SLR camera with lens attached (up to 300mm f/2.8), 4-5 additional lenses, flash; tripod or monopod, accessories, personal gear and laptop. 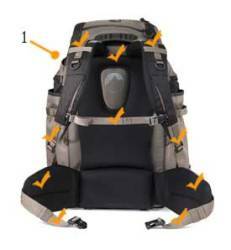 The bag features Premium suspension system with 10 adjustment points, Superior-quality technical and lightweight performance fabrics, Hydration-ready side pocket with seam-sealed pouch, Hydration-ready side pocket with seam-sealed pouch, Practical and plentiful interior organization, Removable waistpack and “Checkpoint-friendly” laptop sleeve in front pocket. The Lowepro Pro Trekker 300 AW has exterior size 15.4W X 14.2D X 18.5H in./39 X 36 X 47 cm, interior size 11.4W X 6.5D X 14.6H in./29 X 16.5 X 37 cm, Notebook Compartment Inner Dimensions: 10.2W X 1D X 15.2H in./26 X 2.5 X 38.5 cm, and weighs 6.8lbs/3.1kg. 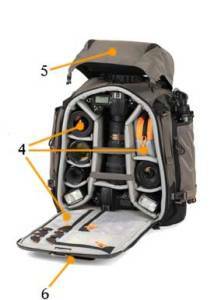 The Pro Trekker 300 AW is the ultimate hydration-ready, expedition camera backpack. It offers superior protection, durability and comfort with Lowepro’s patented All Weather AW Cover and premium suspension system. Inspired by Lowepro’s world-famous Trekker series of backpacks, Pro Trekker 300 AW appeals to professional outdoor and adventure photographers who need a solution that travels well-in rugged terrain or by air. The Pro Trekker 300 AW is available in Mica/Black. 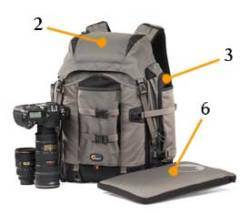 This entry was posted on Tuesday, February 8th, 2011 at 1:47 pm and is filed under Accessories, Camera Bags. You can follow any responses to this entry through the RSS 2.0 feed. You can skip to the end and leave a response. Pinging is currently not allowed.